This is one serious blunder. I can’t believe I forgot to post this incredibly good veggie burger that includes cauliflower. I know, you must be saying, “No-more-cauliflower!” If you are looking for an outstanding veggie patty, don’t count this one out. 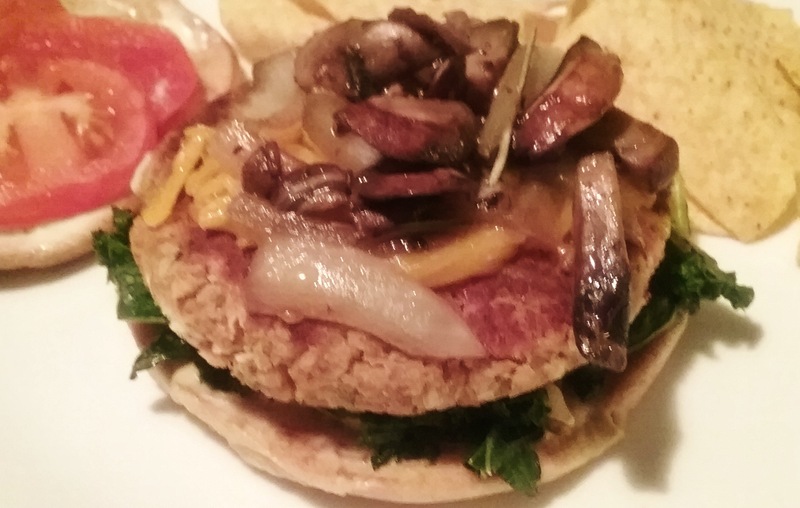 There are probably more veggie-burger-patty posts on this blog than anything else. It is also true that in each case the latest is always the best. This one really is! Hear me out. If you have labored over as many veggie burgers as I have, it’s likely that you have established your own preferences. Personally, I like the falafel flavor range: cumin and other warm spices, plus a little heat all work in this format. Not so much that it overwhelms other flavors. Not too wet or too dry; it must hold its shape. Not too heavy or too light. We want to be fully satisfied, but not have a bomb to process. Healthful ingredients are key. A variety of vegetables plus a combination of grains, legumes, pulses and/or beans all help to balance, boost food value, and increase taste, nutrition, and overall interest. Yes, the perfect veggie patty must have a lot going for itself, and who would think cauliflower could be such a big player? My recent cauliflower marathon confirms all of these suspicions. » Its assertive yet mild flavor profile works well with the falafel requirement. » It has the ability to hold its shape with the right binders. » It is light, nutritious, and a big team player. 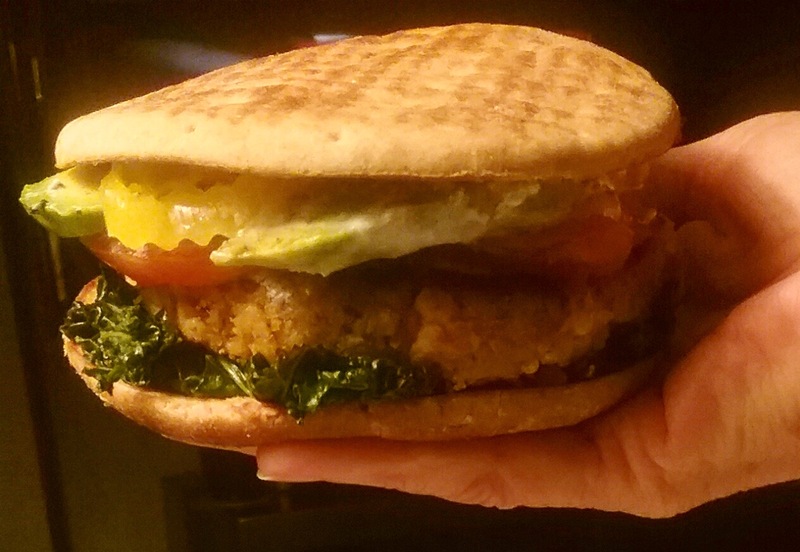 May I present the most outstanding veggie burger… of the day? Any of all of the following: grated cheese, tomato, avocado, pickled pepper, yogurt sauce, Sriracha, sprouts, or sautéed kale. To prepare the cauliflower, cut into florets. Cut or pulse in food processor until the size of large rice grains. Set aside. Rinse the lentils, place in small pot with 2 cups water and bring to a boil. Reduce heat and simmer until soft but still holding shape, 10-15 minutes. Soak the bulgur wheat in 1 cup boiling water with a pinch of salt. Cover and let stand 15 minutes until swelled. Drain. In medium sauté pan over medium-high, heat the olive oil and add the onion and the thyme, cook to soften, about 2 minutes. Add the mushrooms and garlic, stirring to soften the mushrooms. Add the coriander, a few grinds sea salt and freshly ground pepper and sauté to remove additional liquid, 1-2 minutes longer. Place in bowl of food process. To sauté pan, add 1 tablespoon coconut oil and then the cauliflower. Season with red pepper flakes and a sprinkling of salt. Cook until cauliflower begins to soften and color 3-4 minutes. Don’t overcook. Remove to processor bowl. Pulse all the vegetables, bulgur, and lentils until coarse texture, but not pureed. Place in large mixing bowl. Stir in falafel mix, the lemon juice, and the egg. It should for a loose mass. Cover and let rest 20-30 minutes in fridge. Stir up to 1 cup panko into the mixing bowl to form a cohesive but not too wet mixture that holds together well. The panko is designed to bind and lighten the mixture, don’t over mix. It will also help with browning. Divide into 8 portions, shape into patties 3-1/2” x ½” thick, and place on parchment lined pan. Cover and chill 20 minutes longer or up to 1 day. Over medium, heat skillet with 2-3 teaspoons coconut oil. Cook in 2-3 batches. Cover while cooking the first side, about 5 minutes, until browned and well heated. Turn, add a bit more oil and brown second side, about 4 minutes longer. Cool on rack. Serve with bun or pita or choice. Top with grated cheese, tomato, avocado, pickled pepper, yogurt sauce, and shredded lettuce or sautéed kale. Yield: 8 patties.